To complete any full speaker set up, it’s usually recommended to get yourself a top quality subwoofer. 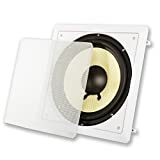 The best in wall subwoofer will usually deal with any frequencies between 20 Hz and 200 Hz, and although you don’t need a subwoofer, it does add a great deal of quality to your sound system set up. In order to get the best subwoofer for your needs, you should consider the brand as well. Whilst the majority of the in wall subwoofer market is taken up by well known brands like Polk and Klipsch, you can often find a gem with some lesser known companies. Either way, whether you want an established reputable brand or an up and comer, I can help you decide which the best in wall subwoofer for you is. Are In Wall Subwoofers Any Good? Subwoofer Q & A – Is a subwoofer necessary? Why is my subwoofer not working? Where do you put a subwoofer? Is a subwoofer necessary with a soundbar? 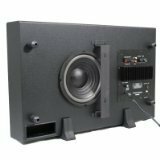 Designed as part of a complete sound system set up from Klipsch, the RW-5802-ii is a prime example of a what a decent in wall subwoofer should be. If you have a decent budget and you want to invest in a full home sound system, then this subwoofer could be an integral part of your set up. It will be the core of your sound system, so it is worth investing in a good quality subwoofer like this if you are looking for the best sound quality. Into the specs; this subwoofer has dual woofers, both long throw. They’re active woofers as opposed to passive, which will suit many and is ultimately down to personal preference. If you don’t know the difference between active and passive, click here. The woofers are Cerametallic, which is a decent quality material and to be honest, it’s the least I’d expect of a product of this price. Cerametallic woofers are almost indestructible, so you can be sure that they will last a good while. Whilst you can paint the grills of this subwoofer, I can’t for the life of me work out why you’d want to. The grills look great as it is, so I’d advise you against doing that. I understand painting the grills of a cheaper subwoofer if you don’t like their appearance, but you don’t want to ruin the classic look of these grills. Note: This is probably just personal preference, as since this a few friends have said to me that they like to blend the grills in with their wall color. I still don’t like doing this, but each to their own I guess. The sealed enclosure also makes this extremely easy to install, which is a massive bonus as you won’t need to splash out more cash on getting someone to install it for you. All in all, you’ll struggle to find a better subwoofer than the RW-5802-ii. It delivers breathtaking sound that will support the entire infrastructure of your setup. As with other Klipsch products, the sound quality is excellent and at the frequency becomes more defined with a subwoofer, it’s important to maintain a great sound clarity. You won’t get any distortion with the RW-5802-ii, which is a common concern with subwoofers. Although it will probably be the most expensive speaker in your sound system, I’m confident that it will blow the other speakers out of the water. This is both in terms of sound quality and sheer power. Unless you’re holding mansion parties every weekend, I seriously doubt you’ll use half to the potential power of this subwoofer. I have friends that have been buying Klipsch products for decades. This isn’t just due to the sound quality, but you also get excellent customer support when you buy from a big name brand like Klipsch. Of course, the price will be a factor for many people. As you need both this subwoofer and the amplifier to match, this can get pretty pricey and it might be out of your price range. Remember that the subwoofer will be one of the more expensive things that you’ll need to buy as part of your sound system, so it is worth investing in it as it will be the most important part of the puzzle. I can’t be too critical of this in wall subwoofer as I do genuinely like it, but I’d rather the appearance be more ‘Klipsch’. For example, if you have other Klipsch products, they’re distinctly recognizable in the black and orange coloring. However, how am I meant to show off my Klipsch collection if the grills are plain white and pretty subtle? Maybe that’s just an ego thing, but you can’t have this subwoofer without the grill, which is how I would prefer to have it if it were in my own home. Kinda petty I know. I’ve personally tested some Klipsch products myself, and have always found them to be top quality. The RW-5802-ii is an example of one of the best in wall subwoofers on the market right now. Remember, you’ll want to pair this subwoofer up with a good sound system to get the best out of it, including an awesome amp. You will have to pair it up with the RSA-500 amplifier. With that in mind, I recommend this set from Klipsch. If you’re a fan of their products, you can’t go wrong with this full in wall set. Designed to be part of a good home theater system, the IWS88 is significantly cheaper than the majority of subwoofers that I’ve listed. This is why it gets a such a high spot on my list. I think for it’s price, it offers a lot of subwoofer for the money. Like most subwoofers, it is passive. This means that you’ll have to buy an amplifier to use with this subwoofer (make sure you get a dedicated amp). The recommended amp by OSD Audio is the SMP250, which is definitely a pretty decent quality amplifier. I thought that I had better mention this, as the last thing that I want to do is recommend a subwoofer without you guys realising that you’ll need to have an amp to use it (it’s in pretty small print on their website!). Anyway, what I like about this subwoofer is that it doesn’t cut corners on quality. It offers the best it can for it’s price. For example, the polypropylene woofers aren’t particularly expensive to make, but they are robust. They perform well, and they create a decent quality of sound when you consider the price. If you are looking to add some bass to your sound system, then you should consider this subwoofer for your collection. It’s reinforced back plate will make sure to help increase the low frequencies vibrating throughout your household. Whilst price shouldn’t be the most important thing when you are purchasing a new subwoofer, it definitely is a crucial part of any buying experience. The IWS88 offers fantastic value for money that you’ll struggle to find with other subwoofers, as often they’re pretty expensive. The build quality is great. It’s made up of some pretty high quality materials considering the cheap price. Whilst I can definitely say it isn’t top of the range, it definitely is a better build than your average bargain basement sound system. It fits nicely somewhere in the middle, in my opinion. It’s extremely easy to install this subwoofer, which can be a difficult part of getting a new in wall subwoofer. You should be able to do this fairly easily if you have any previous experience with DIY and cutting holes in your walls. If you want to know how to do this properly, click here. It definitely doesn’t have the power to match a more expensive subwoofer. It’ll perform well in a small room or your lounge, but it isn’t ideal for a space bigger than that to be honest. You might have to up your budget a little if you want to fill a bigger room. It also doesn’t have the specific low frequency quality that you’d want from a subwoofer. As it deals with any sounds up to 500Hz, this is much more than what you’d expect from a sub (average is around 200Hz). A general rule is that the better quality the sub, the more specific the sounds it produces will be. I don’t like hearing mid range sounds out of my sub, which 500Hz is bordering on in my eyes. It doesn’t match the rest of the OSD Audio products! It’s a sort of beige coloring, whilst the other products from OWS are all white. My OCD would go through the roof with this; why, OWS, why? If you’re after a cheap option to flesh out the bass in your home, go with this OWS subwoofer for a great value buy. At 10 inches, it’s significantly bigger than other similar subwoofers. Due to this, you’ll have to create more space for this subwoofer in your house. I usually prefer the size of my speakers to be smaller, but this is all down to personal preference. You might expect it to use super cheap materials, though you’d probably be surprised to find out that it uses a kevlar cone and a rubber surround. The surround is important, and I’ve often found that a rubber surround is far superior to other materials like plastic. Don’t even get me started on foam surrounds; they can have lots of problems and deteriorate pretty badly. Actually, the build of this subwoofer is particularly surprising (and I mean that in a good way). It has all the materials of a speaker that might cost twice the price. It’s also extremely accurate with the bass, but this is mainly due to an extended throw drive assembly. One thing that I will advise with this subwoofer is that you should get an expert to come and install it for you if you can. There are a few little tips and tricks that you can use to get this sounding better than usual than only an audiophile would know; for example, adding structural support to the base of the subwoofer could be invaluable in stopping any rattling from the sub. Whilst it isn’t essential to get someone to do this for you, you might want to consider it for optimum results. I actually really like the design of the HCS10, even if it might be a bit garish for some people. It’s definitely noticeable due to it’s size and color, so beware that you might struggle to get this one to fit into your household without it affecting your aesthetic. This is a cheap option, and you really won’t find anything cheaper available right now. If you’re on a tight budget, then there aren’t many better options. For the price, they can handle a decent amount of power. If you use it with a good amplifier and you set it up properly, then you should be able to get a really good sound from the HCS10. 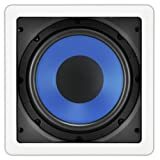 For a subwoofer, the bass quality is directly related to it’s price. That means that it’s average at best. I always say with speakers in general that you get what you pay for, and that’s definitely true with the HCS10. Whilst it’s cheap, it’s middle-of-the-road quality at best. You can’t really play this subwoofer at a high volume, which is what many of you might intend to do with it. At 50%, it plays relatively well. But the higher you go from there, you’ll notice some distortion which will ruin your listening experience. Another cheap option from Acoustic Audio, who produce some of the best budget subwoofers on the market. Remember that this is a passive subwoofer, so you will need an amplifier with this one. You can do your own shopping for the best amplifier, though Acoustic Audio recommend the WS1005. Definitive Technology are a super interesting company in my opinion. They’re not just interested in sales like most companies, which is pretty evident through their social media. Check out their Twitter here, as they’re always updating it with cool stuff and tech information. Back to the subwoofer. It’s completely enclosed, which means it’s made to specialise in very low frequencies and deep bass. It deals with frequencies between 16 Hz and 200 Hz, which is about normal for any good quality subwoofer. Don’t make any mistake; this subwoofer will resonate through your entire house if you have the volume loud enough. The sound is crisp and clear, without any artificial sounds. What I particularly like about this subwoofer is the design of the grill, as it won’t get in the way of the aesthetic of your interior. If you are looking for one of the best in wall subwoofers on the market, then look no further; Definitive Technology have produced a great competitor with this 15 inch subwoofer. It’s so aesthetically pleasing that it makes me happy just looking at it. I like things to be a subtle look that still shows off that you’ve got a new gadget. This subwoofer will blend in with your lounge easily, whilst still adding some elegance and integrity. Whilst this sub is a good choice for a home theater, I’d love to use it as part of a complete house system with a variety of different ceiling speakers and in wall speakers – it has the depth to support the whole house with it’s sound. They are made specifically for bass reproduction, which means that the lower frequencies from this subwoofer will be unparalleled (within this price range, anyway!). Why you’d want a quiet subwoofer I don’t know, but this one really is particularly loud and noisy. It’ll vibrate through your house and your neighbours, so make sure you’re aware of the power of this subwoofer. It’s not cheap. High quality sounds come at high cost prices, and this isn’t a cheap subwoofer. If you have the extra money then great, but if you don’t there’s plenty of other subwoofers that will do a good job at a cheaper price. If you are looking for a subwoofer at the higher end of the market, then maybe consider this one from Definitive Technology. Another OSD Audio product for the list, and with good reason; they make some pretty decent quality subwoofers. This one is the IWS8, which is the little brother of the IWS88 (which also made the list). The reason I decided to include this one is that some people aren’t looking for a massive subwoofer that will blast low frequencies throughout the house. No, for some a better option would be to get one or two IWS8’s and place them strategically in the lounge for optimal sound. There are a few things I like about the IWS8’s. They’re a solid choice for subwoofers on a budget, and for you price you pay they’re actually a surprisingly good quality. They’re easy to mount and make for an easy setup. I’d definitely recommend them to newbies as they are pretty much everything you need in a subwoofer and more. If you really want optimal sound, you could invest in 2 or even 4 or these subwoofers and place them throughout the lounge. Then you’d really be in for a treat! They are very easy to install, which is handy. The instructions are clear and simple. This means that you won’t have any issues installing them, even if you’re a novice. They’re cheap! I hate to keep going on about the prices of speakers, but it’s a necessity unfortunately. We all want to save money, right? They won’t have the quality low frequencies that you’d find with other subwoofers. It’s a good quality basic sub, but it isn’t top of the range and it certainly isn’t meant to deal with super low frequencies under 40 Hz. The basic appearance is pretty lacking in quality; you’ll have to splash out a bit more on a subwoofer if you’re looking for something super snazzy. You really can’t go wrong if you’re buying speakers from Polk. Theatre Solutions may not be the biggest name brand on the market, but this multi set of subwoofers is certainly one of the better quality sets that I’ve seen recently. Along with the wall templates that will make them pretty simple to install, they have a mounting lock system which ensure that the grills stay on your subwoofers and that they’re secure in your wall. One thing that you might be asking yourself; is it better to go with one subwoofer like the majority of people do, or is it better to go with several small subwoofers to help spread the low frequencies throughout the room? Well, it depends. If you prefer a bassier sound, you might be better option for a single speaker than can produce more depth. But if you’re just looking for good quality low frequency that will resonate throughout your house, you might be better off going for a set of subwoofers like this set from Theater Solutions. For four smaller subwoofers, they’re available at a really fantastic price. They’re a good option if you prefer to use smaller subwoofers as opposed to one larger speaker; this can be a great option to spread the sound around your house. The frames are fully paintable, which is great if you’re looking for some speakers that you can easily alter to suit your home. Theatre Solutions are a young brand but they have excellent customer support and you’ll undoubtedly have no troubles contacting them if you experience any issues with your subwoofers. In terms of quality, this set of subwoofers does not match some of the others that I’ve listed here. They are significantly cheaper but like anything, a lot of high quality products come with high quality price tags. Right, I want to get right into the juicy bit here and clarify a few things about in wall subwoofers. If you’re an audio newbie, then you might think that an in wall subwoofer would be a natural accessory to a complete in wall speaker system. And yes, you’d be right; they are designed to complete a full set-up in your home. But if you’re an experienced audiophile, you might be questioning the idea of having a subwoofer embedded in your walls. I mean, how will the in wall sub sound in comparison to a regular free standing sub? Well, there are pros and cons to each option, which I think you should have a look through before you bite the bullet and invest in a subwoofer for your home. Of course, the main pro of having an in wall subwoofer is that you avoid having a big, bulky subwoofer taking up half your living room. As subwoofers are naturally big, then it can definitely be annoying having to find a position in your lounge for it. Whilst usually it won’t be too much of an issue, some of the more powerful subwoofers do tend to be quite large and heavyweight. Wouldn’t it be nicer to save that floor space for something else? Well, you can do that by getting an in wall subwoofer. Probably the main bone of contention that I’ve seen with in wall subwoofers is that you’ll have to know the exact spot to put your subwoofer. Many argue that it isn’t possible to get an ideal place for your subwoofer on first attempt. You can’t exactly place your in wall subwoofer, and decide to change it’s position if you don’t think it sounds good enough. Well you can, but it’d take you a long time to cut new holes, refill the old hole.. it would be a nightmare! Whereas with freestanding subwoofers, you can easily change their position and get a completely different sound. A lot of experts say that by “moving your subwoofer an inch, you can make a mile of difference” with the quality of the sound. I’d tend to agree with them, and I have noticed that positioning my subwoofer in a slightly different location makes it sound completely different. That’s why I’d advise you to get an expert in to fit your in wall subwoofer, as you don’t want to go to a considerable amount of trouble just to position your sub in the wrong position. One thing that’s good about freestanding subwoofers is that if you’re a DIY lover, then you can usually find a way to embed a subwoofer into your walls, even if it wasn’t designed to do so. Go check out avforums.com if you’re interested in doing your own DIY and don’t know where to start. Some of the guys over there have used their skills to put freestanding subwoofers in their walls with great results, and they look super cool. As stated above, the main concern with a freestanding subwoofer is that it will take up a significant amount of space in your living room. If you have the space to spare, this probably won’t be a concern to you and you can opt for whichever you prefer. Though for many people who are looking to save space in their lounge, then getting a good in wall subwoofer can be an essential space saver. Subwoofers specialize in super low frequency sounds below 40 Hz. The majority of pop music today will not need these super low frequencies, so if you’re only going listen to pop music and watch the odd film through your sound system, then no you don’t need a subwoofer. However if you like other genres of music like Electric or Hip Hop, much of this is heavily influenced by bass sounds. For the best experience, it’s a good choice to get a subwoofer. But it’s not something you ‘have to have’, it’s just a nice addition to a good sound system. Is a subwoofer a speaker? Of all the subwoofers I’ve seen, the majority of them have had no issues; it’s been the cable between the subwoofer and the receiver that has been the issue. That, or it’s something to do with the settings in the subwoofer itself. What I’m saying is that it’s rarely a problem with the sub itself, so make sure you’ve checked all the other possibilities before you conclude that you’ve got a faulty subwoofer. The likelihood is that the issue is in your wires, power or the settings of the subwoofer themselves. This is actually quite a tough one, because I don’t believe there to be a definitive answer. It will almost certainly be different for everyone, as different lounges have different arrangements. Add to that it’s an in wall subwoofer and it makes the job even harder. I tend to keep my subwoofer in the corners of the room, low down and separate from the other speakers. Whilst it isn’t entirely necessary to have a subwoofer with your soundbar, it might sound a bit thin if you use a soundbar alone. Accompanying it with a subwoofer can be a good way to balance the sound within your home.